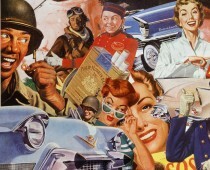 Mid-century America was the golden age for the golden years. As the baby boomers grew up living out the suburban American Dream of plenty, it was assumed we would eventually cruise comfortably into easy retirement just as our grandparents and parents before us had. After all, hadn’t we watched as our elders, who like clockwork upon turning 65, received along with a gold watch and a retirement party, a big fat pension. Aided by Social Security and their copious savings they were set to step out of the rat race into a life of leisure. I watched as one by one, literally and figuratively, the seniors in my family set sail for that life of leisure they had worked so hard for. Come winter nothing beckoned to this new leisure class than a winter cruise. 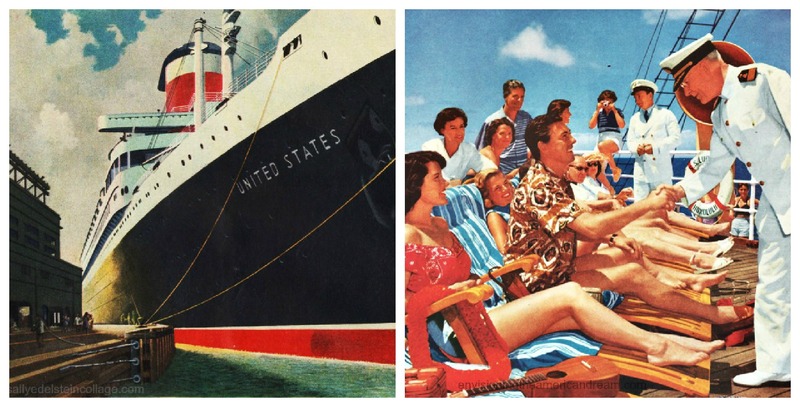 Every summer at family barbeques, my retired great Aunts would regal us with their winter travel plans that always included a glamorous pleasure cruise to some exotic location. While most of the gals at my suburban Long Island backyard barbecue were comfortably- fun- loving- casual, in their Ship n’ Shore patio pants, peddle pushers and cunning Capris, my former career gal great Aunts, in their Claire McCardell dresses and Bonnie Cashin separates, were dressed less for a backyard barbecue than for lunch with the girls at Schraffts nibbling on date- nut bread and cream cheese sandwiches. Their urban dress belied the fact that their closets bulged with cruise wear, that charming class of summery clothes that seemed reserved purely for the high seas of the luxury line cruises they took each season. Apparently, unlike the Virgin Islands, Long Island was not considered a port of call. Whether to Paris or Port-au-Prince, an elegant steamship was their transportation of choice and the top shelves of my white bedroom hutch were lined with dozens of Madame Alexander souvenir dolls in assorted national costumes, the display a testament to the world travelers these ladies were. 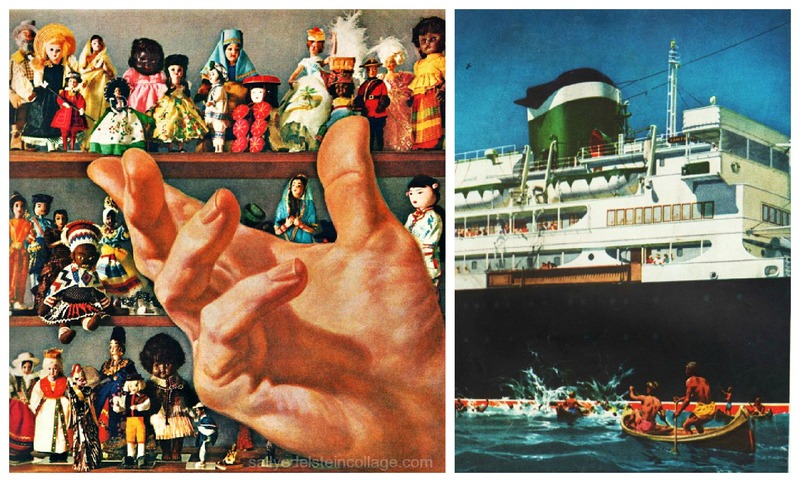 Tokens from their many trips, these foreign dolls like the cruise ships themselves, exuded a stately formality. With their aloof bisque faces, stiff bodies and exotic clothes they seemed inaccessible never to be played with, so unlike my familiar cuddly American dolls. Ironically those native souvenir dolls were more than likely made by silent women sitting in a loft on the fringes of the Bronx just as my all American Tiny Tears was made in Japan. In this dawning space age of shrinking distances and expanding horizons, when commercial jets crisscrossed the country and now even the ocean with the ease of an Inter Continental Ballistic Missile, leisurely cruise ships with their sedate writing salons, grand ballrooms, and endless stream of trunks filled with formal clothes to wear at the Captains Gala dinner, seemed to belong more to the genteel age of the Titanic rather than the age of the Titan Missiles. Nonetheless, seeing relatives off on a grand cruise was still considered a special occasion full of pomp and circumstances. 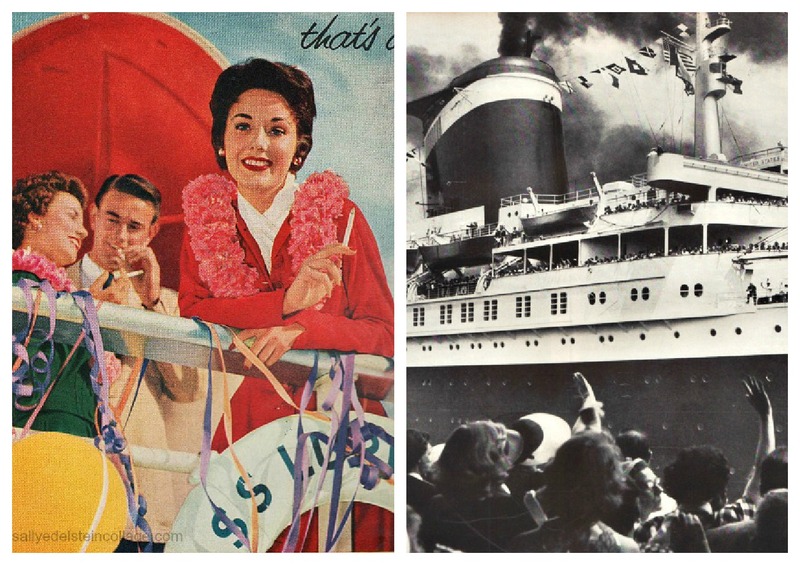 Festive bon voyage parties were held in crowded staterooms filled with family and friends decked out in their fanciest finery, toasting the sea-faring traveler with bubbly pink champagne, petit fours and tiny crust-less tea sandwiches cut into dainty diamonds. The sea air fairly crackled with a sense of urgency with the frantic rush of uniformed messengers dashing up and down decks to deliver last-minute flowers, telegrams bon voyage baskets and the latest best-sellers, before the final, insistent, blaring of the ships horn alerted “all ashores who’s going ashore” sending family scampering anxiously down the steeply slanted gangplank. 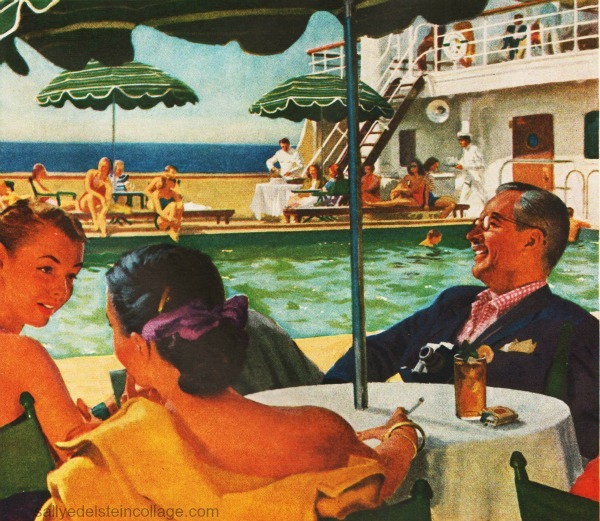 With the late afternoon sun sparkling on the Hudson River, you strained to spot your loved ones on deck amongst all the other bosomy dowagers, waving farewell, fluttering embroidered handkerchiefs amidst colored streamers flapping in the wind as the final sight of the grand ship looming high above the shadowy pier steamed away. It all seemed to belong to a sepia toned time, not the sparkling Kodachrome world of those who think young. For the jet setting Pepsi generation with their Instant Polaroid Land Cameras who were going new places and finding new ways to get there, flying the friendly skies was the glamorous way to venture out into the cold war world.